Looking to add that quintessentially English touch to your home? Whether it's the familiar fragrance of an English rose garden or beautiful, traditionally made toiletries like Grandmother used to have, a Heathcote & Ivory voucher will help you get the right atmosphere for less. From classic brands to more modern designers like Cath Kidston, Heathcote & Ivory voucher codes will save you money when you shop for fragrances for your home. Founded in 2000 by Dennis Aaronson in Marylebone, London, Heathcote & Ivory was established as a small family-run business manufacturing fine glycerin soaps and scented candles to traditional methods. Quickly establishing themselves in the industry, the company soon grew in popularity, expanding to be stocked by several major high street outlets across the country and opening new premises in Primrose Hill. Today, Heathcote & Ivory is one of the UK's leading producers of fine traditional home fragrances and toiletries, found in private homes, hotels and businesses up and down the country. With Heathcote & Ivory's success in the market, the company soon found themselves approached by some of the top names in fashion and design to develop, produce and distribute their own ranges of toiletries and home fragrance brands. Through partnerships with famous names like Cath Kidston and Sanderson, Heathcote & Ivory have brought traditional toiletries to a whole new market and made them fashionable like never before. Heathcote & Ivory are committed to producing quality, ethical toiletries and fragrances that are completely free from potentially harmful chemicals such as parabens and sulphates. Instead, they use only the most natural ingredients to create beautiful products that are kind to the skin and delightful on the nose. It is the quality of their products, their attention to detail and the honesty of their prices which sets Heathcote & Ivory apart from their competitors and makes them a brand which their customers return to time and again. At the Heathcote & Ivory online shop customers can browse through a wide range of toiletries and home fragrances from beautiful body washes and softening hand creams to drawer liners, scented sachets and diffusers for creating a beautiful atmosphere in every room of your house. They can also shop for a wide range of specially selected gift packages, toiletries for men and much more. Want to get shopping with Heathcote & Ivory? With a Heathcote & Ivory voucher you can enjoy fantastic savings while you shop. Whether you want to buy a gift for someone special or treat yourself to something lovely for around the home, Heathcote & Ivory vouchers are a great way to get what you want for less. Partnerships with leading brands such as Cath Kidston and Sanderson. Browse our website until you find a Heathcote & Ivory voucher that suits you, then navigate to their website to begin shopping. Click on a product for more information then click 'Add to basket' to buy. When you're finished shopping, click on the 'Shopping cart' icon. Enter your Heathcote & Ivory discount codes in the box provided and click 'Apply coupon'. If you've enjoyed shopping with Heathcote & Ivory, you might also like to take a look at more great deals on fragrances and toiletries at stores like The Body Shop and The Fragrance Shop. Or, if those aren't right for you, you'll find plenty more to browse in our Beauty & Health section. Looking for a voucher code for Amazon UK? Check out the category Beauty & Health. In category Beauty & Health you will find lots of coupons for online stores such as Debenhams, Heyland & Whittle. Enter your Heathcote & Ivory voucher in the box provided and click 'Apply coupon'. If you need to return a product for any reason to Heathcote & Ivory, please contact the company to discuss your requirements. Need to contact the team at Heathcote & Ivory? Whether you have a question about your order, want to know more about their traditionally made products or simply want to find out how you could make big savings with Heathcote & Ivory voucher codes, you can contact the Customer Services department by accessing the online contact centre here. Want to find out more about natural toiletries and home fragrances with Heathcote & Ivory? The company maintains a profile across all your favourite social media networks. Follow them for lots of exclusive content including new product previews, special offers, competitions and more. You can also use these pages to find out more about saving money with Heathcote & Ivory vouchers. Don’t forget to check them regularly, as you can never be sure when a free Heathcote & Ivory discount code might be waiting for you! 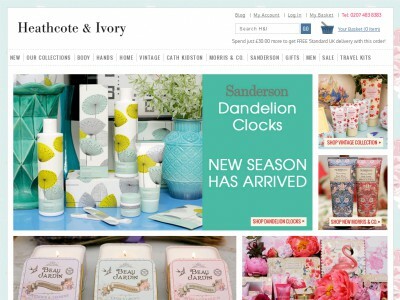 Buy now online at www.heathcote-ivory.com. I've always been envious of the posh soaps my aunt keeps in her bathroom, but I could never afford them for my own home. But thanks to the Heathcote and Ivory discount code I found online, I've been able to splash out on some fabulous scents. There are loads of Heathcote and Ivory bargains to be found at heathcote-ivory.com – I just chose my favourite toiletries and entered my Heathcote and Ivory free coupon codes for great savings. So if you want a posh bathroom without the price tag, check out the latest Heathcote and Ivory code.